Gordon Ramsay Has How Many TV Shows?? When Does He Have the Time to Cook? Gordon Ramsay is a world-renowned chef, but he’s had more TV appearances than restaurants. It’s hard to imagine how he has the time to sleep, let alone cook. Known for his despotic presence on popular shows like Hell’s Kitchen and Kitchen Nightmares, Ramsay is as entertaining behind the cameras as he is talented in the kitchen. Here are some of our favorite Gordon Ramsay shows. Ramsay’s first show, Boiling Point, documents the intense eight months leading up to the opening of his first restaurant, Restaurant Gordon Ramsay, which is now his flagship. Even then his temper was short and his voice loud, but I guess the world saw something they liked because a long TV career would follow. Perhaps Ramsay’s most famous show, Hell’s Kitchen is where his volatile temper comes out the most. 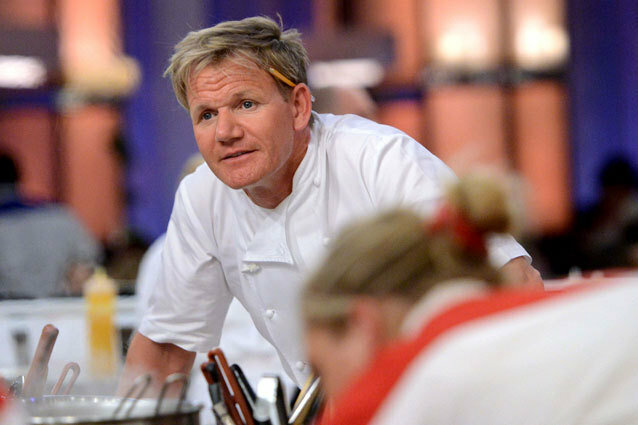 Acting like a drill sergeant, Ramsay constantly yells at the 18 contestants as they go through grueling elimination challenges to compete for a position as head chef at a high-end restaurant. A fascinating look at middle America through the food industry, Kitchen Nightmares follows Ramsay as he visits restaurants across the country on the brink of closing and tries to save them over the course of a week. During his observations, he often makes shockingly disgusting discoveries in the kitchens, storage rooms, and service. MasterChef is like the American Idol of cooking competitions. Thousands of home cooks from around the country audition for the three judges (Ramsay, Joe Bastianich, and Graham Elliot) until 16-18 are narrowed down. These contestants must go through elimination challenges each week until one person is named MasterChef. This show offers a unique look at Ramsay, outside of his fame. For the miniseries, Ramsay travels to the most remote villages of India and Southeast Asia to learn the recipes and cooking techniques of the locals. From fried tarantulas to balut, Ramsay is a good sport about even the weirdest foods. It’s totally refreshing to see the usually arrogant chef as a humble student of little old ladies and men who have never heard of him. Despite its profane-sounding name, The F Word is actually quite tame compared to some of his other shows. The show covers a wide range of food topics, but its main premise involves Ramsay cooking a three-course meal for a restaurant of 50 diners, including celebrities who participate in challenges and the meal preparation. For this show, Ramsay hand-selects 16 restaurants in the UK out of 12,000 submissions to compete for the title of Best Restaurant. The 16 restaurants consist of all different types of cuisines, from British to Indian to North African. Two restaurants of the same cuisine must compete, and the winners advance until one restaurant and cuisine remains as the winner. Proving that he’s not afraid to step out of his comfort zone, Ramsay goes to a Brixton prison for six months and teaches the inmates how to cook and run a sustainable business that sells goods to the public. They form Bad Boys’ Bakery, and their lemon treacle slice is still served at 11 cafes in London to this day. Yet another side of Ramsay people probably don’t know about is his activist side. In 2010, Ramsay played investigative journalist and explored the inhumane shark finning industry. Having great respect for the animal, his mission was to get influential restaurants in London’s Chinatown to stop serving shark fin soup by exposing them to the industry’s atrocious and cruel practices. Four leading Chinese restaurants have banned shark fin soup as a result. This is quite possible Ramsay at his best: in the kitchen. He guides viewers through elegant, gourmet, but easy-to-make recipes that you could “stake your life on.” In addition, he offers helpful tips on everything from how to choose the right chicken at the market to which essential tools every home cook should have in their kitchen.